Wensleydale Creamery is looking to move into yet another export market as it joins the Food Minister at a trade fair in Dubai this weekend. 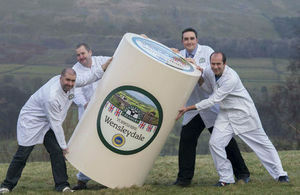 Yorkshire Wensleydale PGI is already exported to 16 countries across the world including the USA, China and Australia. Exports now account for 14% of the business. To meet the ever growing demand for their cheese, Wensleydale Creamery will undergo major redevelopment in 2014-15, which will enable them to double output and increase productivity. It has recently appointed a new business development manager, Gary Johnson, to drive growth in new international markets and build global partnerships. As part of their planned export growth plan, The Wensleydale Creamery is exhibiting at the 2014 Gulfood show for the first time this year. Taking place from 23-27 February 2014 at the Dubai World Trade Centre, Gulfood is the world’s largest annual food service, hospitality and retail event. Gulfood will offer The Wensleydale Creamery the perfect stage to showcase their products, explore new markets and begin to build relationships and partnerships in the in the Middle East and beyond. Yorkshire Wensleydale cheese has been handcrafted in Wensleydale, in the heart of the Yorkshire Dales, since 1150, when Cistercian monks first brought their skills and recipes to the Yorkshire Dales. As they travel to the International food exhibition in Dubai, Gulfoods with the largest ever delegation of British food and drink producers, George Eustice Food Minister encourages others to follow their example to help economic growth. Wensleydale Creamery is a great example to other rural businesses of achieving growth through their motivation to export. They have also demonstrated how British food and drink producers can profit from protecting their product’s heritage and reputation; having worked with Defra to achieve recent EU Protected Food Name status for Yorkshire Wensleydale. Wensleydale Creamery saw the importance of ensuring that the quality and reputation of Yorkshire Wensleydale was protected. They successfully applied for the EU protected food name scheme and achieved Protected Geographical Indication status at the end of last year. This status means that in order to use the protected name the product must be made in Wensleydale and according to the traditional recipe, ensuring that the quality and reputation of the cheese is protected for the long term. To others looking to apply for protected food name status for their product, The Wensleydale Creamery would advise producers to consider what makes their product special and why it should be protected. Protection might be based on the raw materials used in a particular local area, the tradition of a method of production, or the skills involved in making a high quality product. The team at The Creamery are thrilled that our much-loved cheese has now been recognised by the European Commission. Our heritage and provenance makes Yorkshire Wensleydale cheese taste truly unique and we’re delighted this is now officially recognised with Protected Geographical Indication status. PGI status is another vital part of our business growth plan and ensures The Wensleydale Creamery’s long term aim of keeping Yorkshire Wensleydale cheese production in the heart of the Yorkshire Dales for generations, is now a reality. David Hartley, Managing Director of The Wensleydale Creamery, has always had an interest in the process of cheese production, first working in dairies aged 17. In 1992, aged 29, David found himself as the Production Manager of The Wensleydale Creamery, leading a management buyout when the owners, Dairy Crest, decided to move production of Yorkshire Wensleydale cheese elsewhere. The buyout was eventually agreed in November 1992, in time for Christmas production of Yorkshire Wensleydale cheese. Since then, David has been at the helm of The Creamery, not only taking the range of cheeses from strength to strength but also supporting the local economy and increasing employee numbers from 59 in 1992 to over 220 today.